Some pretty things for you all to look at this Friday morning. I hope you all have lots of pretty things to look at all weekend! Oh... 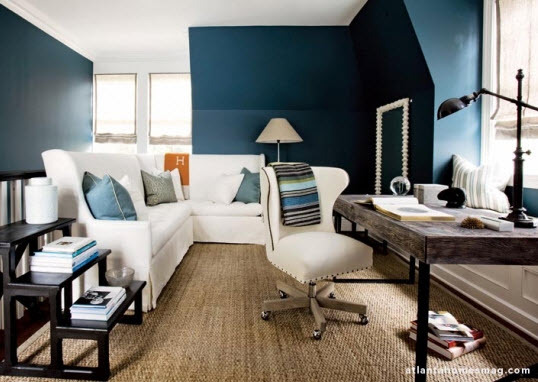 I love that white swivel chair... very cool! **how is the planning coming along?? i want that chair for my desk...looks so cozy. I, too, NEED that desk chair!!! Any idea which issue of AH&L it's from? I'd love to find the source. This bachelor's faux black leather with plastic arms monstrosity has GOT. TO. GO! I wish my desk chair was so pretty! That light fixture in that second pic is SO fun! LOVE the first photo!!! I plan on painting a wall with that color!! why is that darn blue color in the top photo so darn beautiful these days..
love the color of that wall! happy friday! Such pretty things. Love it! ooo i want that white sectional! can i just say that i love you color scheme you use in your blog logo/banner....seriously..every time i visit you i think that! OMG everything about both of these pictures is be-stilling my heart. the blue...the emerald.....aaah. love it! I really love the color of that first room! Hope you have a great weekend. we probably like more of the same than you think. I just like to post random things... I love the train photo in the below post. 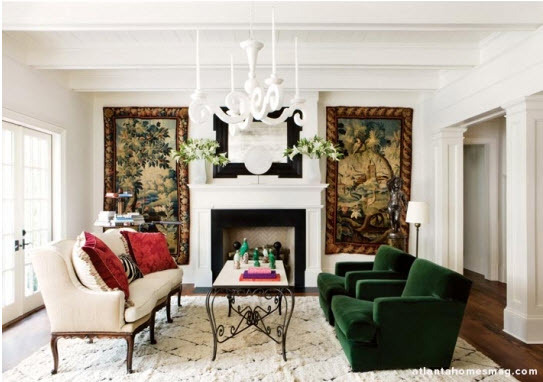 Are you and Mrs. Elle Decor besties yet? I'm going to New York in two weeks if you want to come and swing by her office for a face to face chat. I think Bryan has agreed to write on my blog next week. Should be interesting. Make sure to leave him lots of love notes:) he'll probably quit on the first day! because...I'll be in Mexico. So please miss all my extra fun, extra long comments. you always have such pretty things every day of the week. Love the white chandelier! Gorgeous pics, AS USUAL! Those green chairs. Too perfect. Especially in that room. Love it. That blue in the top image is beyond!